Countertops remain an essential kitchen component because this is where all the action takes place. It’s important when it comes to kitchen decor since it sets the tone and feel of your space. The material that remains on top for countertops is quartz, which Forbes declared as a favorite in 2014. Up to now, it remains the reigning material for kitchen décor. At kitchenandflooring.com, we believe countertops are the elements of fashion and functionality. These two factors are the reasons why quartz kept its place ever since. Quartz is one of the hardest surfaces on earth. It’s also the most abundant mineral found on the world’s surface, in its natural form. This material can withstand bangs and bumps of pots, pans, and dishes. It can resist scratches, stains, and even spills. But it’s not stain- and scratch-proof. Countertops comprise of ground-up natural quartz combined with polymer resins to bind it. An amazing durable surface comes forth from this process, offering color and design flexibility. The final material has a natural look and feel, perfect for any design ideas. Quartz countertops are resistant to stains and scratches because it’s inherently nonporous. This quality makes it 99.9 percent bacteria free, as well. Unlike granite, quartz doesn’t need sealing, so it requires very little maintenance. Routine cleaning only involves the use of a damp cloth or a paper towel. You should clean up spills right away before they dry to prevent hard water rings or stains. You can avoid damaging your quartz countertop by using cutting boards and trivets. Other than this, it doesn’t need that much of your attention every single day. You can enjoy its natural beauty without worrying too much about it. 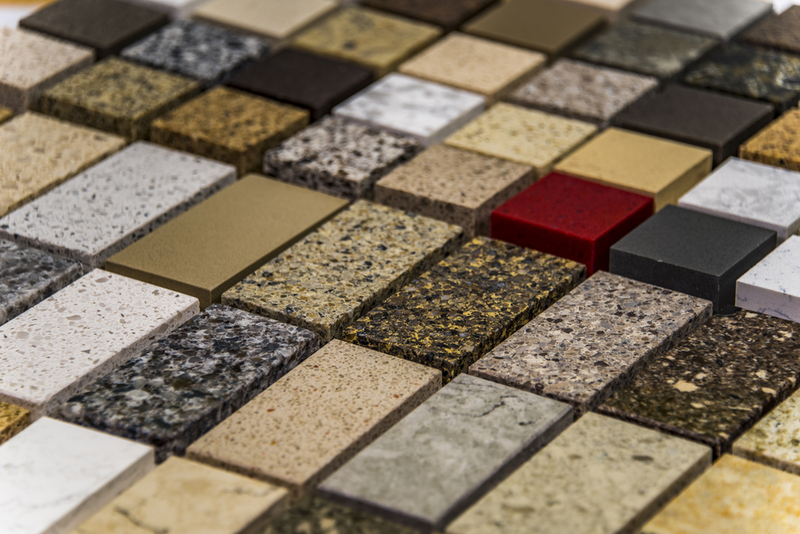 Quartz countertops display a consistent variety of color and texture. The variability of quartz appears in its design. Some patterns and colors shift and change during the process, producing a lovely slab. Every quartz slab’s appearance varies, depending on the size and mix of the granules. Large crystals may give a more mottled look while smaller, finer crystals provide a uniform appearance. These colors match almost any décor so you can rest assured that the countertop you choose will suit your kitchen’s design. Countertops made from this material are solid. The natural mottling and color from the quartz crystals run throughout the material. Colors vary, but they range from bold, bright colors to subtle neutral hues. A quartz countertop is all you need to make your kitchen a show-stopper, and we have that at Main Street Kitchen and Flooring. Countertops provide the perfect opportunity to improve your kitchen’s visual appeal. Our countertop designs are eye-catching because we make sure they stand out. Aside from quartz, we have a whole range of products available, including ceramic and porcelain, stone lab, and stone. In addition to top quality products, we also provide professional installation through our licensed, insured, and experienced installers. With our countertops professionally installed in your kitchens, expect lasting durability and beauty in your home. Older PostWhich Rooms Need Ceramic Tiles the Most? Newer PostHardwood Flooring: Does It Suit Your Kitchen?